As it turns out, I’m not the first person to ever write a book! When I sit down to start writing a new app, I don't agonize over what files to create and what to call them. I don't start at an empty project in my editor and wonder where to start. No, I click File | New Project in a menu, or I run a console command, and shazam, I have a skeleton of a project. Maybe I have a website with a few sample pages, or a mobile app with a single screen, or a console app with a Main method already defined. I use pre-built templates or scaffolding to give me a leg up and show me where to put the main pieces of my application, so I spend less time worrying about the structure of my application and can get right down to business writing the code that'll make it do something unique. So why, on my last two book projects, have I pretended that no one has ever written a technical book before? A lot of the stress and angst I've experienced while working on my Sublime Text books has been caused by one question: Where should this piece go? Experiment with Sublime Text and scan the web to learn about a group of features, taking notes in the process. Open Scrivener and paste in my pages and pages of notes. Review my notes several times, looking for logical connections among the fragments of information and shuffling them around until they're more or less grouped. Start writing in the spaces between my fragments, stitching them together into something that resembles cohesion. My process, in other words, is very bottom-up. I collect disparate pieces of information and then stare at them, hoping for order to emerge. This works, to an extent—the brain excels at making connections like that. But good grief is it a painful process. Every scrap of information is treated equally, and it's difficult to know what I can safely omit. So I convince myself that I have to include everything, and the project bloats out of control. I contort my writing to shove in minor details that the reader probably won't care about and doesn't need to worry about. And of course I always end up with a pile of leftover pieces that don't seem to fit anywhere—but I have to put them somewhere because I wrote them down when I was taking notes!—and I end up scurrying around and poking them into cracks and crevices (known technically as insets and sidebars). I'm acting like no one has ever written a technical book before. Like there are no tried-and-true structures that hundreds of authors and editors have developed and fine-tuned through decades of tears and red ink. It's downright silly when I think about it like that. I never would have realized all of this if I hadn't decided to force myself to complete a detailed outline for my current book project. Normally I start off with good intentions about creating an outline, but as soon as the discomfort sets in, I decide to wing it and just fall back to the process I described above. But this time, I've vowed, I'm not going to let myself skimp on the outline. I'm going to push through the discomfort and map out the entire book in detail. I was squirming in my chair, shuffling a few scant bullet points around aimlessly, and it hit me: What if I could start with a preexisting structure and just plug in what I've learned from my research? And as it turns out, there are well established structures. I spent 30 minutes talking to my friend, John Sonmez, who cranks out an insane amount of technical content every month, and every one of his courses follows a well-defined formula. I grabbed a few well-reviewed books from Amazon, and wouldn't you know it, they follow a similar structure. After I made this “discovery,” my angst over how to organize my book disappeared, and I cracked open Scrivener and started cranking out my outline. All of the information I'd collected started organizing itself into this predefined structure. It was almost effortless—I was just putting the pieces where they clearly belonged. And when I occasionally got stuck, I'd refer to my examples until I found an example of how another author had solved a similar problem. Through this process, I've relearned an important lesson: Don't allow yourself to get stuck trying to solve a difficult problem in a vacuum. Look for a ready-made solution so you can keep moving. The conventional wisdom is that writing books is an arduous process and one that's not really worth the time you'll invest. At best, a book makes a nice business card that'll help you land more consulting clients or get a better job. Sorry, I don't buy it. And over the next 12 months, I'm setting out to prove that the conventional wisdom is wrong. I don't believe that writing a book has to be a horrible experience. I'm currently struggling through my second book, and I'm starting to see patterns in my difficulties–and many of them are the same problems I always encounter when tackling a large-scale project. Many people struggle with writing a book because they haven't learned a systematic approach. With my first book, my outline consisted of a few bullet points. I did research on the fly as I wrote it. I had no strategy for how to structure the book, and no framework to help me decide what to include and what I could safely ignore. So I tried to include everything. My progress was glacial—a couple of hundred words a day at best. At that rate, a 25,000-word book takes months and months to produce. That first book was a painful experience. Or is, I should say, since I'm still writing it. I've just assumed the pain was inevitable, until lately. But not everyone struggles the way I have. Some writers have learned to fly, to crank out new books in weeks instead of months. Nathan Barry has published four in the last year. He's my hero. The Self Publishing Podcast chronicles Johnny B. Truant's journey from a plodding writer to a 10,000-words-a-day monster. I've been working with ankle weights on, believing that I can't write quickly, that I don't have enough time to produce like those guys. Enough of that. This year, I will become a book-writing machine. Over the next 12 months, I will publish four books. Here's what it's going to take for me to pull this off. First, I need to increase my writing speed. I work a full-time job as a software developer, a demanding job that requires a lot of focus. I also have a family—a wife and two adorable toddlers. With these existing responsibilities, I've found I can reasonably squeeze in 10 to 15 hours of work on side projects per week. I've tried to do more, but I wind up running out of gas pretty quickly. I've analyzed my writing productivity, and I am currently able to produce about 240 words an hour when working on my book. That's not great—in fact, I think it's pretty pitiful. I need to double or quadruple that rate. Initial target is to get up to 500 words an hour on book-related material. My freewriting speed is more like 1200 words per hour. The difference is that I spend less time thinking about what I'm going to write and coming up with examples. Clearly, I can increase my writing speed by doing more of my thinking ahead of time, before I sit down at the keyboard to start hammering out copy. That means outlining. I've done a lot of research on how to write faster, and the first piece of advice every fast writer gives is: Outline, outline, outline. Outlining helped Johnny B. Truant achieve his insane daily word counts (although in fiction it's called “plotting”). And I've discovered that I'm a really bad outliner. It's hard. I get started, jot down a few bullet points, and as soon as I hit a point where I don't know where the outline should go, I throw up my hands and decide that it's a waste of time, and I should just start writing. I can't think of a better way to ensure that I'll bog down later, probably at the exact same point where my outline petered out. So doing more thinking ahead of time in the form of outlining is part of the plan. Another component is systematizing my approach, or developing a solid writing process that I follow every time I start a project. I think one of the main reasons people struggle when writing books is that they're starting from scratch and trying to organize a big mess of information. But why act like no one has ever written a book before in recorded history? I'm writing my ebook in the least efficient way possible: Every day, I publish an update of at least 100 words. And you know what? It's working great. Writing involves several discrete steps: organization and outlining, research, writing the first draft, editing the final draft, formatting and publishing. To write quickly and efficiently, you shouldn't combine steps. In my case that's even more true: Writing about a technical topic requires a lot of research, which usually means I spend a lot of time fiddling with Sublime Text plugins, reading configuration files, scanning documentation and source code. Publishing an update every day means I spend 80 percent of my “writing” time doing research before pounding out a few sentences and hitting the publish button. Yesterday I spent 20 minutes working up a PHP example function and making sure it actually ran before I used it in a screenshot. “You should be batching your research, then cranking out a full chapter from your notes!” he screams. But you know what? That didn't work. I tried setting ambitious goals for my writing: I'll publish one chapter a week! I'll write 1,000 words a week! By breaking up my writing into a week-long project, I never developed the habit of writing daily. And my self-imposed deadlines slipped by unmet. So I've changed my goal. Rather than focusing on finishing my book, which encourages me to put a premium on efficiency, I've dedicated myself 100 percent to developing the habit of daily writing. Personal finance guru Dave Ramsey recommends paying off a mountain of debt by starting with the smallest credit card balance, rather than tackling the one with the highest interest rate. Why? Because the biggest impediment to financial success is habits, not math. Paying off the smallest debt provides a quick win that reinforces the new financial habits you're developing. I'd like to write 1,000 words a day like Nathan Barry. I want to become a writing machine, cranking out blog posts and ebooks at dizzying speed. But before I worry about optimizing my writing process and increasing my words per hour, I'm going to ensure that writing is as much a part of my daily routine as brushing my teeth. Because the 100 words I wrote this morning beat all those chapters that never happened. P.S. If this habit stuff sounds interesting, I'd encourage you to check out the Power of Habit. August, 2012: I'm pounding out pages for an ebook about Sublime Text. The book is growing steadily, and with it, a sense of panic: What happens when I'm done? My entire promotional strategy consists of pushing the publish button! I'm a programmer, not a sales wizard. Marketing seems like black magic. The thought of my hard work going to waste makes me sick. September 27, 2012. I feel queasy, but I've already announced the big day — no turning back now. Over my lunch break, I log in to the dashboard for the publishing software I'm using, take a deep breath, and do the deed. I close my browser and get back to work, trying hard to pretend nothing is happening. And the sales kept coming. I earned more than $1,000 in the first 24 hours, and ended my first week at the $2,000 mark. The book is still selling steadily four months later, and my total earnings are closing in on $5,000. As I learned, promoting a book isn't a black art. With a little advance planning and effort, you can ensure sales from day one. Here are five key actions I took that contributed to my successful launch. I originally chose Leanpub as my publishing platform because of their unique workflow: You write your manuscript in Markdown, then publish from your Dropbox account. But I took for granted a Leanpub feature that made a much more significant contribution to my launch-day results: the humble “coming soon” page, which features a description of your book and a form where would-be buyers can enter an email address. It didn't seem that important, so I threw up a few lines about the book and linked to the page from my blog. At the time I was too shy to say much about my project, but this page did the talking for me. By launch day, I had a mailing list of 157 potential buyers. This list was rocket fuel for my launch-day sales: At least 20% of my email list subscribers purchased the book. I learned late in the game that email is far and away the best way to promote a product. So push past your shyness and start building an email list as early as possible. If your publishing platform doesn't offer a “coming soon” page, invest few hours to set up your own hosted WordPress site and creating a MailChimp form. Every email address you collect now is one more potential sale on launch day. A third of my launch sales were a direct result of a step I almost overlooked. Shortly before the launch, I realized that I should see if I could enlist the aid of community leaders with established followings. I contacted 10 or so well-known programmers via Twitter and offered them a customized discount code they could share with their audiences. About half of them responded positively, including the biggest ally I was hoping to recruit: Peter Cooper, lord of the open source email newsletter realm. Peter kindly included my discount code in a weekly newsletter that focuses on programming tools. As a result, I increased my first-week sales by 33%. Before you launch, reach out to community leaders and ask them to help you promote your book to their audiences. Give them something they can offer their followers, so they can do their audiences a favor while helping you out. Wins all around. Deciding what price to charge was gut wrenching. I agonized. I emailed other successful ebook authors. I read blog posts. One piece of advice stuck with me, although I don't remember the source: Settle on a price that you feel comfortable with. Then double it. I just knew people were going to hate me for it. But that didn't happen. Sure, a few people complained, but amazingly, many people paid me more than the cover price. One person even paid $50 for the book. It was a great lesson in value-based pricing. Most of my readers are software developers who make $30, $50 or $150 an hour. I've personally saved myself hours of time with some of the tips I was including in the book, and my suggested price is equivalent to 5 to 45 minutes of billable time. The takeaway: Set a price that's based on the value you're providing readers, not what everyone else is charging. Writing a book is a lot of work, and I soon realized that it would be a lot easier to keep my momentum if I launched the book before it was “done.” I waited until I had enough a critical mass of content to provide value to my readers, and then I published it as a beta version. I was worried that I'd lose out on launch revenue. You usually make the most sales during an ebook's launch, and since I offered the beta at a lower price than what I'm eventually planning to charge, I felt like I might be leaving money on the table. But on the flip side, a smaller launch payday is better than no payday at all, which could happen if I lost steam before publishing it. Launching early was a good decision. I've gotten great feedback from readers that I'm using to shape the book, and the income motivates me to keep working on the book instead of taking on a consulting gig. Another decision I agonized over was whether to offer any kind of launch-day discount. The idea made me nervous: Would offering a discount cut into my earnings? I bit the bullet and sent my email list and Twitter followers a 30% discount code, good for 24 hours. Of those who bought a copy of my book in the first week, 69% used one of the discount codes I sent out. Give people who are on the fence about your product a reason to buy today with an attractive, limited-time discount. If you'd like to learn more about launching products, the following are a couple of killer resources you should check out. I don't make any money from promoting either: I'm just a happy customer. For a focused look at making the most of your ebook, I recommend How to Launch the **** Out of Your Ebook by Dave Navarro and Naomi Dunford. When I first found their site, I thought, “$97? For an ebook about selling ebooks? Sure, it'll look great on my coffee table that's a coffee table book about coffee tables.” But most of what I did right during my launch came from reading this book, and I'm convinced it paid for itself 10 times over. If you really want to crush it with ebooks and other information products, check out Amy Hoy's 30×500 product development course. The cost for this course makes $97 look like couch cushion money, but it's well worth it to learn a top-to-bottom system for creating products that sell. I'm planning more posts about my experience creating my first ebook, so be sure to follow me on Twitter for updates. I've wanted a standing desk ever since I first read about the idea three or four years ago. But even though the health benefits seem clear, it takes a special kind of guy to stand tall amongst an acre of of low-walled cubicles. That guy I am not, and during my corporate career I stowed the standing desk idea away, alongside my once-held ambition to be a professional magician. Now that I work remotely every day, the only thing that's prevented me from springing for a Geek Desk is limited space. The lower level family room where I work is just about tapped out in the furniture department, and adding another desk would entail getting rid of a nice, solid wood desk we already own. I do have a little open wall space in my office, though, and I've thought about cobbling together a makeshift desk with some repurposed shelving. 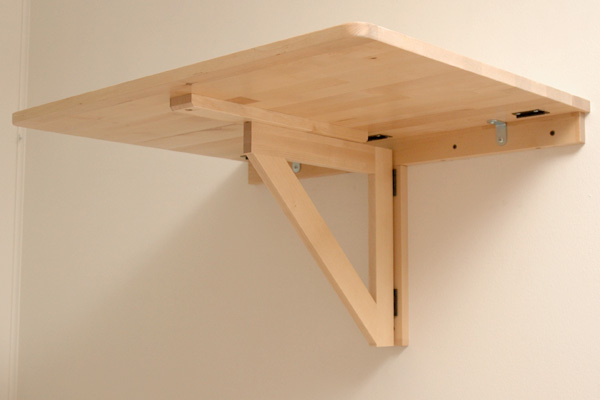 Then I stumbled across Ikea's wall-mounted drop leaf folding table (affiliate link), available on Amazon for $35.49, plus $11.99 for shipping. It seemed too good to pass up, and I'm glad I ordered one. Setup was simple. The desk comes with all the hardware required for assembly, but you'll have to supply your own fasteners to actually mount it to the wall. As it happens, the back side of my office wall is unfinished, so I framed in some extra supports between the studs and installed the desk with some long wood screws. If you don't have access to the other side of the wall, heavy duty drywall anchors will provide adequate support as long as you don't do any swan dives off of your desk. Before drilling any holes, I propped the desktop up on various objects to find the ideal height. I'm 5'9″, and a height of 41″ puts the desk surface just above my belly button. My elbows are bent just a little more than 45 degrees, and I can work comfortably on my paper-thin MacBook Air and my chunkier ThinkPad W520, which raises my hands about 1″ from the desktop. Instead of following the Ikea assembly instructions, I'd recommend first just putting together the section that mounts to the wall, which looks like a T, then using it as a template to help position the fasteners. I loosely screwed one end to the wall first, then set a level on top of the T while I drilled the remaining holes. It's also a good idea not to tighten any one screw fully until the other holes are drilled and their respective screws partially tightened. Otherwise the frame will probably shift and throw itself off level. 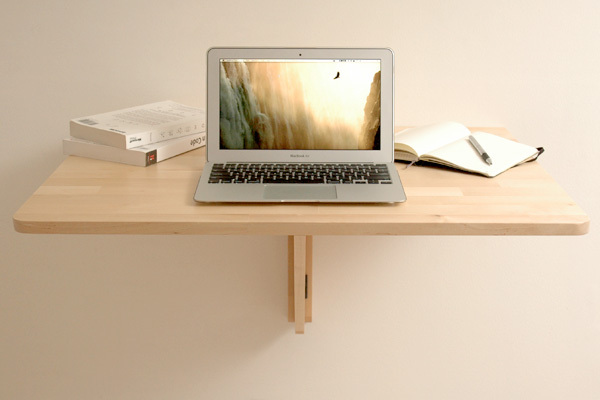 To finish the project off I ordered a 1″ desk grommet similar to this one from eBay for $4 shipped. It'll be nicer not to have to run cords around the side of the desk when I need to plug in. 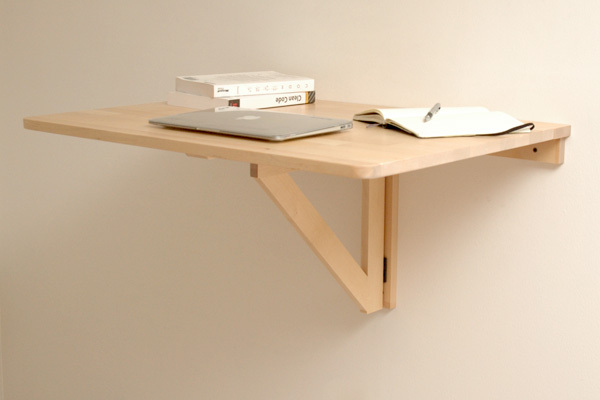 This desk is nothing fancy, but for the price it's well constructed. It's solid wood with a clear satin finish. The surface doesn't flex or bounce when extended, even thought the desk top itself is only about 1″ thick. When folded, it protrudes about 4″ from the wall, making it quite unobtrusive. One minor annoyance that I noticed soon after completing the installation: If I put a little weight on the front edge, the desk makes a slight creak. Initially I assumed this was coming from the screws holding the desk to the wall, but it's actually just the top shifting slightly where it meets the swing-out arm. Putting a little foam rubber padding on top of the arm eliminated the noise and made the whole assembly feel more solid. Overall I'm quite pleased. If you're looking to augment your existing standing desk and don't mind putting a few holes in your wall, this is a great option. Since discovering Getting Things Done four years ago, I've tried just about every task management system out there: text files, Remember the Milk, Toodledoo, Evernote, OneNote, Outlook, paper, hipster PDAs. They all have their strengths, but each was missing some key element that left me wanting more. The search is over, though. Trello is about as close to a perfect platform for GTD as I could imagine. The concept behind Trello derives from the kanban board, which at its simplest is just a cork board on the office wall. Units of work are represented with Post-It notes or index cards, sorted into columns. In Trello, the team at Fog Creek has maintained the simplicity and flexibility of the real-world kanban board while unobtrusively layering on a wealth of sophisticated features. This kanban board approach fits well with my workflow. GTD involves managing many small tasks, and most to-do management tools present to-dos as line items in a grid. These rows tend to merge into a solid mass of data that I can't easily parse. Trello's boards and cards address this by adding a spatial dimension to my lists. This helps me digest the information and allows me to use an item's physical location to assign meaning. Another major strength of Trello is that it provides several tiers of organization: boards, cards, checklists. This makes it easy to manage groups of related tasks and easily escalate tasks into full projects. Cards can also hold a wealth of metadata. In addition to the title field, cards include a description field (which accepts Markdown formatted text), checklists, labels, and a comments thread. This makes it easy to keep project-specific information (supporting documentation, thoughts, links) tied to the task or project. Here's how I have my GTD lists set up right now. Top-level bullets are boards, and sub-items are lists on the board. Anything new that I want to capture goes into the Inbox list. Several times a week, I process this list to zero. Cards from the Inbox will move to my context-specific lists if they are single tasks or to my Projects list if it's a multi-step project. When a task or project is complete, I archive the card. When I'm planning a small project, I'll brainstorm a list of tasks and put them into a checklist in the project's card. During my weekly review, I review each project card and convert the next checklist item into a card on the @NextActions board. If a project grows beyond a few steps, I'll spin off a standalone board to track all of the related tasks. Templates. The Trello team unveiled a nice feature this week: the ability to copy boards. This makes it easy to create template boards. I've always wanted an easily resettable checklist that I could use to walk through the steps in my weekly review, and now I have one. Every week I copy my weekly review template board, which contains about a half dozen cards with associated checklists. For example, I have a card called “Get in to empty”, which contains a checklist of lists my various inboxes (email accounts, physical inboxes, bookmarking tools) so I don't forget to empty any of them. I move each card into an In Progress column when I am focusing on it, and put it in Done when I'm ready to move on. Project-specific boards. Initially I tried forcing a one-card-per-project approach, but now when I start a complicated project I spin off a standalone project board. 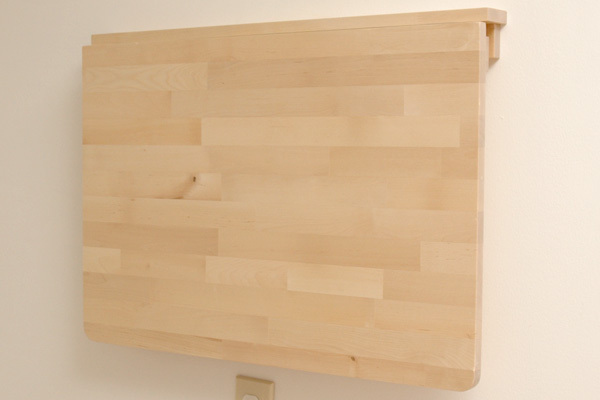 I have a template board for new projects with three lists: Backlog, In Progress, Done. I add new tasks to the backlog as they come to mind and limit the In Progress column to one or two items that I'm actively working on. Work the cards. Cards can hold a lot of additional data beyond just the title. On smaller projects, for example, I'll use the description field to hold the project objectives and any notes or thoughts that may have come out of my project planning. Actionable steps go into a checklist. And even though my boards are private, I'll use the discussion feature to hold random thoughts or links to relevant websites. Managing boards. I try to keep my list of pinned boards (the boards that appear when you click the Boards button in the upper right of the screen) to a minimum. I unpin any boards that I don't use every day, and I close boards that I am not planning to use. It's easy to access unpinned boards either by searching in the boards list or from the All Boards page. You can also control the way boards sort by prefixing with different characters. I like my GTD boards like @NextActions to sort at the top, hence the @ prefix. I prepend an underscore to my templates to push them to the bottom. Keyboard shortcuts. Trello has some pretty good keyboard shortcuts for managing cards and navigating between boards. The ones I use most are B to open the boards list and C to archive the current card. Navigating to my next actions board is as simple as hitting B, then typing @N and hitting Enter. Better tagging and sorting. It would be nice to tag items and filter based on the tags. It would be great to be able to spin off checklist items into cards while maintaining a link back to the original checklist. And for bonus points, mark the checklist item as complete when the card is archived. Moving cards to other boards is a little clunky and requires a few clicks. Have a favorite Trello tip that I've missed? Let me know in a comment below. and I've improved my focus. finished all of the posts in my Google Reader feeds! While not harmful in and of itself, consumption can be a seductive productivity drain. time to plow through my feeds without feeling overly pressured by a ticking clock. Setting up RescueTime to track how I spend my computer time. Unfollowing some noisy and/or irritating people on Twitter (sorry!). Trimming the number of blogs I subscribe to in Google Reader. contact form (still a bit of a work in progress), and migrated all of my old posts from WordPress and Tumblr. just over a week in and still going. release in the Marketplace sometime soon. Written several small scripts and a Chrome bookmarklet that make my daily life just a little bit better. up new virtual machines and repaving my computer. Cleaned up my lists of current and someday/maybe projects, gaining clarity about my goals for the near future. accomplished anything, especially if I wasn't feeling particularly sharp. automatically via an IFTTT recipe. interesting and personally valuable articles awaits.